Hope you can help me. 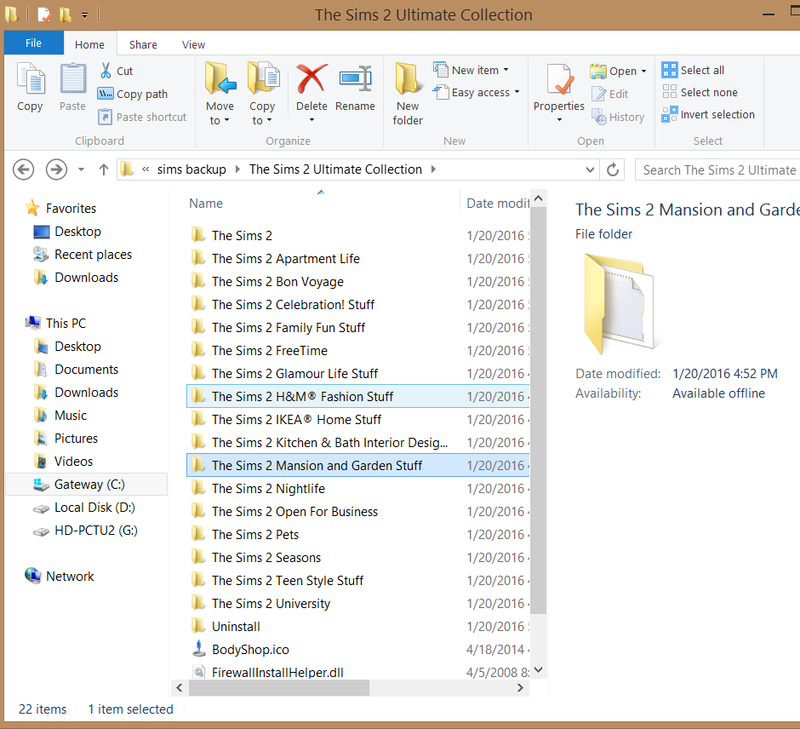 So I have the Sims 2 Ultimate collection which works okay but I do not the option to change screen resolution or use smooth edging (which is grayed out). I did go and download the configs fixes and put them in both my M&G and Pet Files in both the Config and the ConfigCS files. I also figured out how to make it recognize my video care ADM Radeon R5 200 series by adding that into the Vendor list of the Video.Cards.sgr list. I downloaded and tried your Graphic Rules Fix as well. Nothing has worked so you are my last hope. Here's my infor. I don't know what else I can try. Your site was the most informative. Maybe I am missing something. Well, I must be. Hopefully you can figure it out. Thanks so much. It looks like you downloaded the wrong one - you need the Radeon with the texture fix. Thank you for replying! I tried this, both files but it didn't work. Still no option for resolution or smooth edging. Any other ideas? (23-01-2016 06:21 PM)Candi0207 Wrote: Thank you for replying! I tried this, both files but it didn't work. Still no option for resolution or smooth edging. Any other ideas? @Candi0207 Are you running as admin? if you go into lot and open the settings for your graphics can you select resolution and smooth edges? I tried going into the lot, no change. I'm pretty sure I'm running as admin. According to the log MOM is the user and that's me. How would I check that? And if not how do you change it? Are you unzipping it, have you put it in the right place? The reason that I ask is that you still have the 32mb texture error, and if it had gone in the right place, you wouldn't have that problem anymore. Please take a full screen screenshot of where you are putting it please? It's not going to be fixed until the texture memory is fixed. Hi. Actually her Son posting, now. and it had no effect. Lower resolutions will launch, but are still always 800x600 no matter what values go in. Nothing so far has given the option to select any resolution except 800x600 in game. She downloaded a fix to Video Cards.sgr I also applied across all expansions. Both the original .srg and the fix make no change, I don't know what's different except that it's apparently made by http://www.simsnetwork.com per the file itself. Neither file seems to make an impact on the game. I'm a bit confused - does she have ultimate collection or not? That looks more like she's got the DVD version, as none of the folders look correct for UC. Is that the downloaded one? In Ultimate Collection - Mansion and Gardens is a part of 'Fun with Pets' as a combined thing. It also has combined packs for others - yours is separate by expansion pack - which isn't ultimate collection. If it's the DVD's, then it shouldn't be called Ultimate Collection - it should be called 'EA Games'. If she has Ultimate Collection - then she can go on Origin to get the most recent version. (If this is a hacked version, then that may explain why nothing is working). While her texture memory sits at 32Mb - you won't get any other resolution than 800x600, and you'll get low resolution graphics. It won't matter what you've changed it will stay the same. Until we can work out which one it's picking up, it's not going to get resolved by any changes to the graphic rules.sgr - because it's not picking up the one's that have been changed. We know when they've been picked up because the word 'Kiri' appears in the config-log.txt. Just wanted to let you know I reinstalled ultimate collections and added your graphic fix and it is working great now! Thanks so much.